Art Sensation, Doug Hyde, is taking the art world by storm with his emotionally charged pictures that evoke a wonderful feel good factor. Born in Bristol, England in 1972, Doug Hyde became very aware of his artistic talent at a very young age. Throughout Doug Hyde's school and college education he concentrated on the technical side of drawing and painting, but after graduation Doug Hyde was in no doubt as to his chosen career, that of a professional artist. Doug Hyde's bold figurative imagery coupled with a vivid, strong color palette is what makes his art so exciting. Doug Hyde's work represents something that is simple yet immediately impactful. 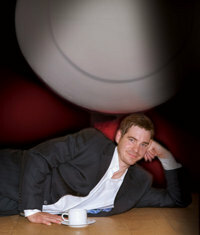 Doug Hyde prefers to produce his distinctive artwork on a large scale. In order to achieve maximum impact Doug Hyde also enjoys operating in plenty of space, thus allowing himself enough physical freedom to express the creative energy that is the key to Doug Hyde. Remember every time you purchase Doug Hyde artwork over $995, shipping is FREE in the continental U.S. and there is NO SALES TAX when you purchase outside of Colorado. 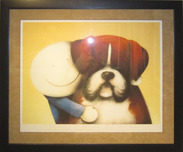 We SHIP WORLDWIDE and offer Layaway for Doug Hyde art.